Nemasys® Biological Vine Weevil Killer controls vine weevil larvae and pupae in an efficient and environmentally safe way. Vine weevils are beetles that attack a wide range of plants, both indoors and outdoors, but are especially damaging to plants grown in containers. They are one of the most widespread, common-, and devastating garden pests. Over summer and early autumn the larvae feed on roots, causing plants to wilt and die, and if they survive, the adult weevils will then eat plant leaves during spring, resulting in irregular-shaped notches on the leaves. Nemasys® Biological Vine Weevil Killer is a safe and effective way to deal with a vine weevil infestation. 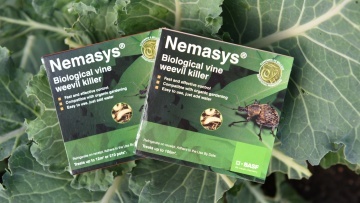 What is Nemasys® Biological Vine Weevil Killer? Nemasys® Biological Vine Weevil Killer contains beneficial nematodes (naturally occurring microscopic worms) which seek out and kill vine weevils. Nematodes attack the pest by entering natural body openings, releasing bacteria that stop the pest from feeding, which quickly and safely kill it. The nematodes then reproduce inside the dead pest and release a new generation of hungry nematodes, which disperse and search for further prey, protecting the area for up to six weeks. Apply nematodes when the vine weevil larvae and pupae are present and the soil is above 5°C. 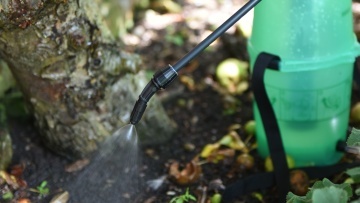 Mix the Nemasys® with water (following the pack instruction) and apply immediately around the base of stems, using a watering can or garden hose applicator. Straight after application, water well so that the nematodes are washed into the soil where the vine weevil larvae and pupae live. Keep the area well watered for at least two weeks after application. Application is recommended between March and October.